Valentine’s Day is the one day of the year when romance can be seen in the form of flowers, champagne and a delicious dining experience for two. For 2014, why not cosy up to your loved one with a bottle of exquisitely smooth Glenfiddich 15 Year Old Single Malt Scotch Whisky, and let your imagination run away to the beautiful Highlands of Scotland. Start a new tradition this February 14th and treat your man to the intriguing aromas and flavours of Glenfiddich’s 15 Year Old. Tradition and innovation collide to give this whisky great depth and consistency with notes of sweet heather honey and vanilla fudge combined with rich dark fruits. With Valentine’s Day being the most romantic day of the year, this is your chance to spoil your loved one and buy him a gift he will truly remember. For over 125 years, Glenfiddich has distilled whisky deep in the rolling hills of the Scottish highlands. 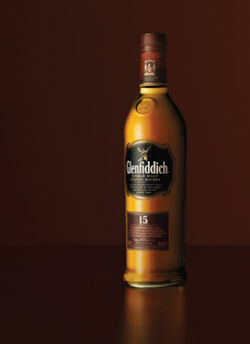 Glenfiddich is one of the few single malt distilleries to remain entirely family owned and is now the World's Most Awarded Single Malt Scotch Whisky. At only £38.59, this gloriously crafted whisky is a perfect complement to any romantic evening.